Restoring and protecting interdependent habitats is essential to the vitality of Sarasota Bay and its tributaries. Estuarine habitats like seagrasses, oyster beds, and wetlands were decimated during the 1950s as a result of dredge-and-fill operations designed to provide boat access to waterfront home sites. To mitigate the extensive damage, SBEP embarked on an aggressive program to restore lost or damaged habitat and protect remaining undisturbed habitats. This is an ongoing commitment that is vital to the health and future of the entire estuary system. Tampa Bay, Sarasota Bay, and Charlotte Harbor are all located on the west coast of Florida and are hydrologically connected to one another. However, each individual estuary program has a unique management approach due to the different anthropogenic influences in the individual watersheds. Although these estuaries are relatively close in proximity, they differ in watershed size, number of tributaries and stormwater systems, population size, frequency and duration of freshwater inputs, and land use types within the watershed at large. Pollutant generators also differ between the estuaries. For example, there are varying degrees of historic impacts associated with industrial and domestic wastewater operations, untreated stormwater, failed septic systems, agriculture, and phosphate production within each estuary. The amount of intact, native shoreline and shoreline habitats also varies between the program areas. SBEP Goal: Restore or create 18 acres of intertidal wetlands and 11 acres of non-forested freshwater wetlands in the Sarasota Bay watershed annually. 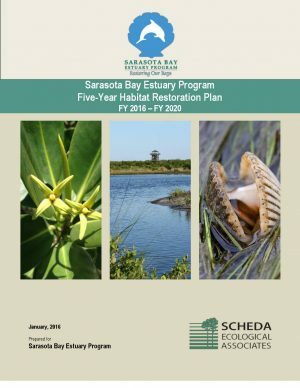 Read the current 5-Year Habitat Restoration Plan for Sarasota Bay. Since its inception in 1989, SBEP has participated in more than 200 projects related to habitat restoration or water quality improvement within the watershed. SBEP serves as a project manager, bringing together the partners, funding, and contractors with expertise in planning, permitting and construction. 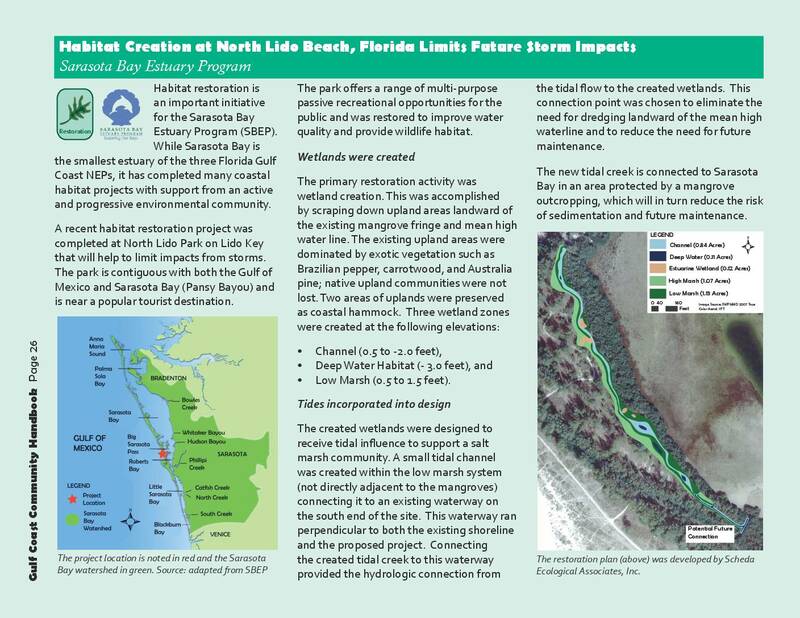 The SBEP also develops a long-range habitat restoration plan every five years to be used as a guide and planning tool by the SBEP and its partners to identify, prioritize, and implement restoration projects throughout Sarasota Bay and its watershed. North Lido Beach Park is contiguous with the Gulf of Mexico and Pansy Bayou. The park offers a range of passive recreational opportunities for the public and was restored to improve water quality and provide wildlife habitat. The primary goal of the project was to create tidal wetlands and refuge areas for juvenile fish. Click the image to read more about the project.